This is personally my favourite town in Santorini. It is overwhelming how beautiful the view is from here. I highly recommend staying in this area when visiting Santorini. My friend and I accidentally stumbled upon this small village and were amazed to discover it was used for some of the movie Sisterhood of the Travelling pants 2. It is a fishing village and has around 5 cute restaurants with tables looking over the bay. To get here – keep driving through the town of Oia and you will come across a sign directing you where to go. *Beware parking is a nightmare so best to take a scooter or a quad bike! Ancient Thera dates back to the 9th Century BC and has the most amazing views of the Island! 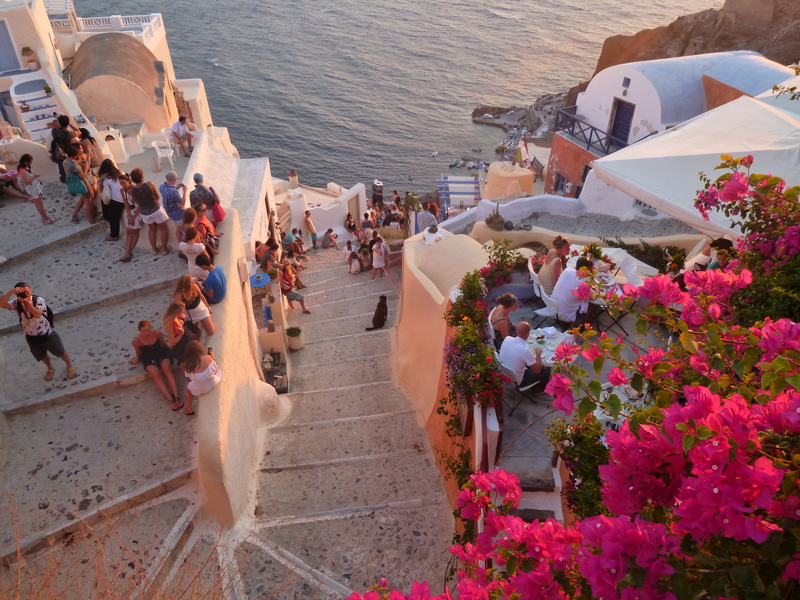 A MUST do while in Santorini. The tour includes a boat ride to the island of Nea Kameni where the volcano is located (on a ship – how cool is that!? ), there you have the opportunity to walk to the top of the crater, where you get to see Santorini from afar, and briefly learn about the history of the volcano. Afterwards you can go swimming in the hot springs that were created thousands of years ago, then you sail to Thirasia Island, where you can eat in the small taverns near the port, swim, or visit the village of Manolas on the top of Thirasia. This beach is well known for its colour, hence the name. It can be reached either by boat or by foot, lounge chairs are available for rent to lie on the beach. Be prepared to pay for one as the sand is very rocky. Awesome place to visit, surrounded by red cliffs and clear water. When in Greece, you must try traditional food. Santorini was my first stop in Greece and I couldn’t wait to try it all. Baklava is my favourite – a sweet nut filled pastry. If you’re on a budget and can’t dine out for all meals like me, kebabs are only around 2 euros. Follow the signs in the town of Oia and park yourself up to watch the sun set. It is a breathtaking thing to watch, but I recommend getting their early to secure yourself a spot as it gets quite busy. Last but not least – have a go at the locals mode of transport and ride a donkey!